Checks or plaid? Now, you’ve got a third option: Checkerboard. 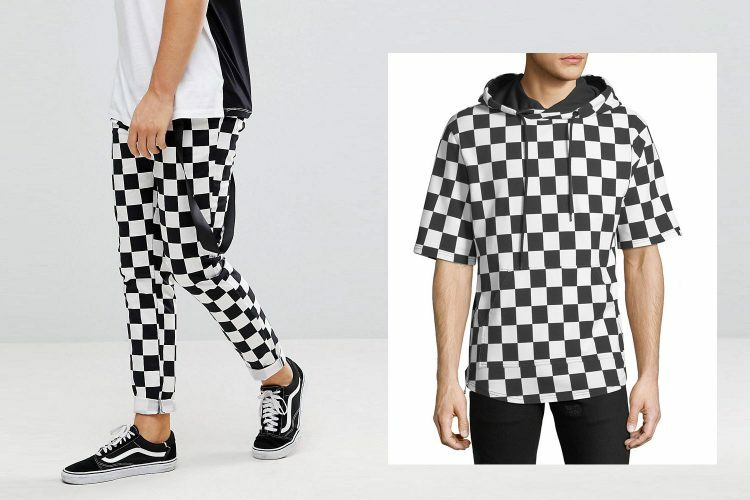 Often associated with Vans’ footwear and skate style, checkerboard prints add a starter level of color-blocking to a traditionally angular and modest print. Yet, starting close to a year ago, runway collections and even casual menswear displayed one clear shift: The preponderance of this two-tone retro pattern. Nothing could escape it, and to date, we’ve spotted it on tees, button-ups, chino pants, jeans, sneakers, and even moto jackets. You often associate gingham with classic button-downs, but this small, accessible print often overlaps with checkerboard, in spite of its demure, occasionally countrified character. While traditionally referring to a cotton-based material, gingham checks resemble a series of squares, almost akin to a grid: A light hue, a darker hue, and one mixing the two – a feature also common with most buffalo plaid patterns. Related to both checkerboard and buffalo check prints, this pattern simply features two colors that alternate across the fabric’s body. Visually, it’s the most straightforward but possesses the greatest degree of contrast. As well, its template serves as the foundation for other check-based prints, like windowpane. Although the latter often evokes a red-based print that’s associated with kilts, tartan simply refers to a multi-faceted check print consisting of two or more thread colors. The result, even with just three shades, produces a rich, angular pattern with several overlapping hues. Plaid, purely from a technical level, refers to the material used for the tartan pattern; however, these days, plaid is used as a catch-all term for most check prints. 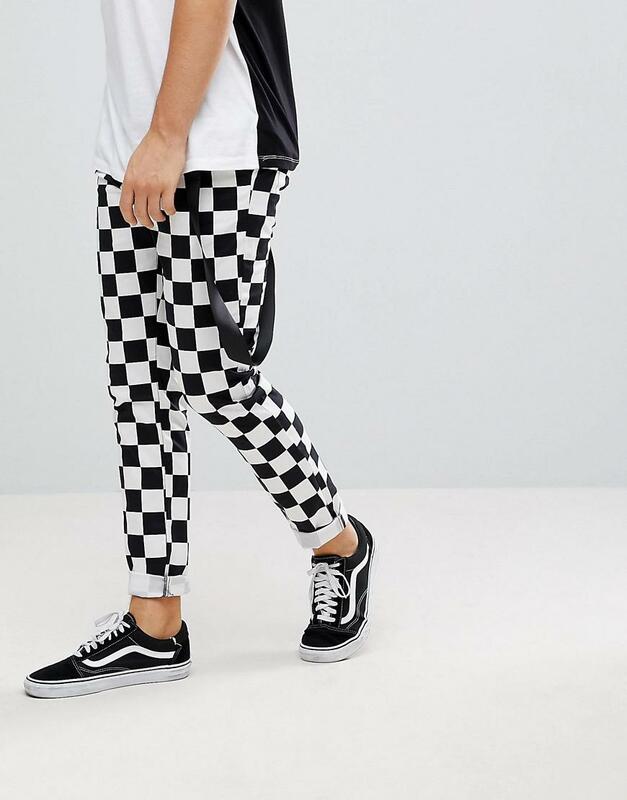 While the allusion to the game is clear, checkerboard prints in fashion often go back to skate shoes. These days, they’re practically intertwined with the slip-on Vans Sean Penn, as Jeff Spicoli, sported in Fast Times at Ridgemont High, and as such, they come with a mix of counterculture, rebellious connotations. However, several years prior to the seminal teen flick’s release in the early ‘80s, Vans added the print back in the ‘70s, after noticing how teens would draw these impromptu patterns down the sides of their shoes. Even today, while Vans has gone through multiple colors, variations, and limited-edition prints, the black-and-white squares can be found on nearly every silhouette – including the effortless Slip-Ons. Yet, as Fast Times turned into a surprise sleeper hit and Spicoli into a stoner icon even decades after its release, the print didn’t fade out. Rather, it went through a couple of pop culture permutations. Anyone recalling the brief ska wave in the ‘90s associates the pattern with the period’s bands – and might remember those iron-on checkered patches sported by the genre’s fans. As well, nearly two decades after, Wiz Khalifa slipped on these skate shoes to, inarguably, reference their original pop culture introduction. In 2018, though, the runways have two overlapping infatuations: Skate culture and the ‘90s. 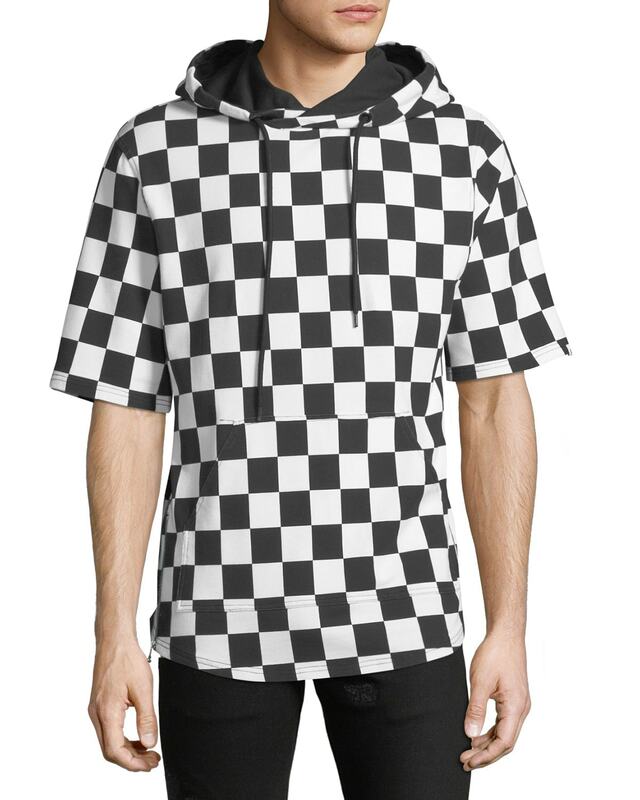 Thrasher tees and Supreme collaborations hit the reverence right on the nose, but while the New York-based skate brand and CFDA Menswear prize winner is busy collaborating with everyone from Comme Des Garcons to The North Face, checkerboard patterns have gradually seeped into multiple high-end presentations. Close to a year ago, Givenchy, still under Riccardo Tisci’s direction, splashed it all over bags, sneakers, and blazers. MGSM, too, magnified it, adding it jackets as a color-blocked, large-scale check print. 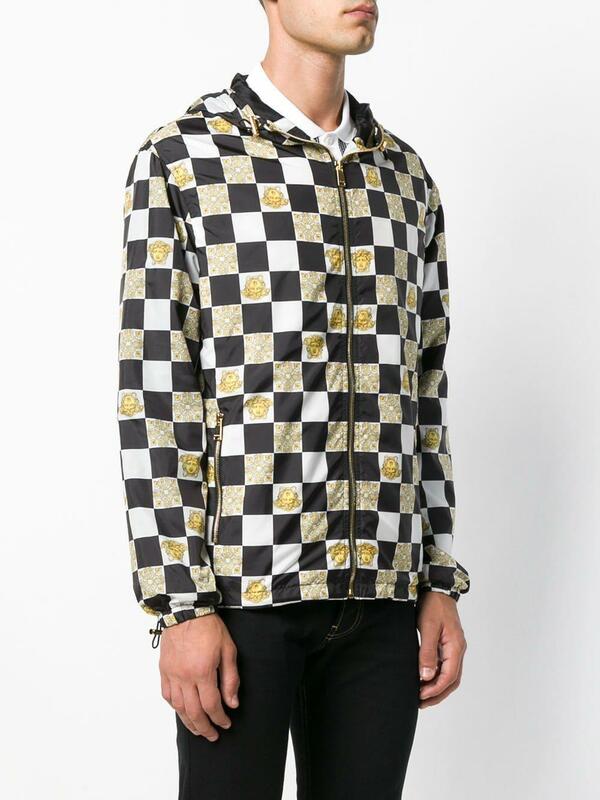 While Versace’s revived ‘90s Greek prints frequently incorporate it in some form, we’ve also spotted the unmistakable two-tone pattern on pieces by Ralph Lauren, Louis Vuitton, Marc Jacobs, and even Dickies. Just a little goes a long way. As such, reserve it for one key piece within your ensemble – a pocket square, a belt, a tie, or even a watch band. Here, it’s enough to catch the eye without pushing things too far. As you do this, though, keep everything else you’re wearing to solid-color tones. Otherwise, pattern clashing results, and unlike with floral or plaid, checkerboard really only meshes with color-blocking and wide stripes. This is pretty much a no-brainer. Go for that retro skater/stoner vibe by channeling your inner Spicoli or Bones Brigade member with a pair of checkered Vans. The Slip-Ons and Era silhouettes tend to be the most accessible for comfort and everyday wear. The Sk8-Hi, while known to make an impact, is very much a statement shoe with its chunkier appearance and high-top silhouette. With the rest of your look, keep it all neutral: Khakis, chinos, or even Dickies’ work pants for a hint of skater authenticity. On top, stick with a button-down or even a graphic tee. Tees to button-downs, pretty much anything goes. Here, though, you’ve got two choices for applying the print. All over is more common, but don’t think of this as your typical plaid button-up. Rather, it’s far from subtle and comes with strong retro connotations. In this case, keep the check small or medium sized, and pair it with solid, neutral-colored jeans or chinos. A bomber or blazer in a similar shade adds the finishing touch. But, if all-over checkers easily goes overboard, the pattern makes a fun accent – specifically, one evoking a racing character. Moto-influenced clothing, from jeans to jackets, is everywhere these days, so the print – as a stripe or panel across your tee – smoothly slides into the vision. They’re out there, and they’re extreme. If you’ve got to ask, “What’s black, white, and groovy all over?”, the answer’s going to be a checkered moto jacket, bomber, or blazer. Pick a door and try it out. Just make sure, with whichever path you take, this piece gets the most wiggle-room.